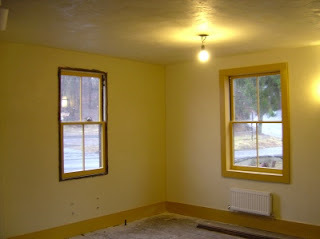 I love plastering days (meaning days, when we plaster), because it changes the appearance of a room dramatically (aside from that, I really love plastering itself, which is almost like being a kid again, playing with mud, except now it is more sophisticated). And today wasn't any different, especially because we got so much done. The bar is almost completely plastered, and it shows (except that I don't have a picture that actually shows it, so you'll have to come by to look at it in person). 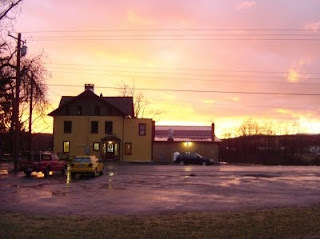 It rained for most of the day, driving rain from the south-west, but at the end of the day we were rewarded with a stunning rainbow, and an even more stunning sunset (doesn't this make you want to sit in our Biergarten, munch on your pretzel and sip on your beer? ).